Krishna personally didn’t kill anyone in Mahabharata war, but is it true? One of the most significant aspects about the Mahabharata war was Lord Krishna’s role in it. He ensured victory for the righteous Pandavas against their evil cousins Kauravas through various tactics. However, he contributed in a mammoth way without taking weapons in hand or killing anyone. But what if I told you that Krishna did kill in the war? The Kurukshetra war started off in the most unusual manner. Arjuna developed cold feet and simply refused to fight. He was overwhelmed with the very thought of killing his own cousins, although they had proven to be evil. The opposition also had his highly respected grandfather Bheeshma and teacher, Drona. Hence, Arjun dropped his bow and arrow. This was when Krishna was compelled to motivate Arjun in fighting the war. The conversation turned out to be the most beautiful enlightenment on duties of a warrior and the real meaning of life, death and journey of soul. The talk turned out to be the sacred Bhagavad Gita. It continues to be the driving force for human beings (not just Hindus) till today and shall continue to do so. This was enough to open Arjun’s eyes towards his real duty. He went onto valiantly fight the war and the rest, as we all know, is history. The war goes down in history as the victory of good over evil. But the biggest evil was inside Arjun. It was his weakness and faintheartedness that stopped him from taking part in the war. This evil force within Arjun was defeated by Krishna. Man can be his biggest enemy if he is filled with weakness. Krishna killed this weakness and with it, the biggest enemy on the battlefield. If he hadn’t done that, Pandavas’ greatest warrior wouldn’t have taken part in the war. The result of this would have been disastrous. By doing this, Krishna also indirectly gave a message that fighting the outside enemy is futile without destroying the evil within. We have always been advised to be good and kind-hearted. We have always been told that imbibing the aforementioned qualities will ensure we live a successful life. However, being good and kind alone is of no use if we cannot distinguish between right and wrong; between Dharma and Adharma. And it is this choice that will ultimately decide our fate in life or where one ultimately ends up. This message is glaringly visible through one of the important characters of Mahabharata – Karna. Karna faced rejection right from the time he was born. He was abandoned by his mother, Kunti since his birth took place outside wedlock through her union with the Sun god. He was raised by Dhritrashtra’s charioteer, Adiratha. After growing up, Karna was eager to learn warfare but was rejected by Drona as he didn’t belong to the Kshatriya clan. He ultimately did learn warfare from Parshurama but by lying that he is a Brahmin since the teacher only taught students from that clan. Karna’s lie was ultimately exposed during the end of his training and he was cursed by Parshurama that he would forget the divine knowledge of using his deadly weapon, Brahmastra when he would need it the most. At a time when there was no hope left for Karna, he met Duryodhana, who not only considered him as his best friend but also gave him a position equal to that of his real brothers. In order to make sure Karna could take part in a tournament organized by Dronacharya, Duryodhana also made him the King of the Anga territory. In other words, Duryodhana turned out to be the biggest boon for Karna. Considering he did so much for Karna despite not being of the same bloodline, it was obvious for the latter to be indebted to him forever. So it doesn’t come as a surprise that Karna became the most important warrior for Duryodhana during the great battle of Kurukshetra against the Pandavas. However, Duryodhana, as we all know, was the embodiment of evil. He devised evil ways to denounce the Pandavas of their rightful throne of Hastinapur and to achieve that, he was ready to vanquish them through war. 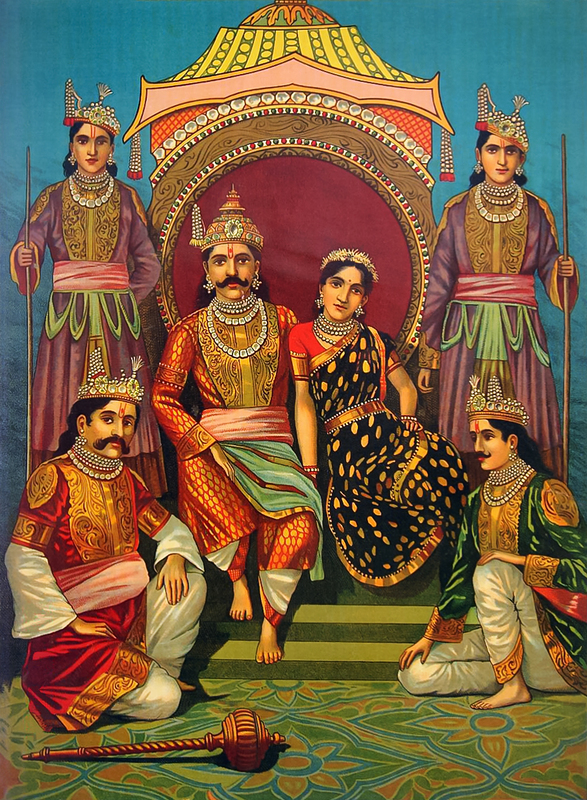 In short, Duryodhana was Tamas personified. So the big question is – How right was for Karna in supporting Duryodhana in his terribly evil mission? Or rather, is there any justification in supporting evil? There answer, as per my view, is a big NO. Despite being fully aware of who is good and who is evil, if you still support the latter, you are doomed even if you are just repaying that person. There is another way of looking at this. As we all know, Lord Krishna is the embodiment of Dharma. Hence, he ensured victory for the Pandavas despite not directly taking part in the war. When Krishna himself made it clear as to which side Dharma belongs to, do we need more examples? So, Karna could have chosen Dharma (Pandavas) in place of Adharma (Kauravas). But he didn’t and suffered a terrible death at the hands of Arjuna. Had he chosen otherwise, the latter stage of his life could have been completely different. Being the eldest of the Pandavas, he would have enjoyed the throne of Hastinapur. Karna had suffered ill-luck or bad fate throughout his life. But many a times, life knocks at our door to give us one last chance of making amends for everything negative that happened to us till now. It is up to us to make the right choice. Fate was against Karna throughout his life but it was his own choice that determined his ultimate fate in life. Lessons from Mahabharata – Episode 3: Is money enough to bring peace? The basic necessities of any human being are food, clothing and shelter. To fulfill these basic needs, it is essential for him or her to earn money. Hence, each one of us is into some profession or the other to make sure we keep earning to survive. But how much money is enough even after being able to live life comfortably? Or rather, is money ever enough? We regularly come across people who are so rich that even their next few generations can live a decent lifestyle without having to work. But despite that, they aren’t satisfied. They continue to devise newer methods to earn even more. If you ask them the reason for their obsession to make more lakhs or crores, their standard answer is – To be happier! But happiness comes from a state of peace or absence of conflict. So can money surely being peace of mind? Now let me present you with some interesting facts. There have been thousands of studies and surveys suggesting that the rich and the super-rich are more depressed than anyone else or are more prone to be depressed. But there is more to it. Many of these studies also suggest that suicidal tendencies are found the most among the wealthy lot. So naturally, psychiatrists come across a lot of people from this class suffering from depression. I personally know quite a few super rich individuals who are depressed. I also know one such person who committed suicide few years back after being trapped into depression. Similarly, I have also witnessed some very well to do individuals getting treated for depression. This, obviously, throws light on few important points – If money is enough to bring peace and happiness, why such large numbers of wealthy individuals are falling into depression? Worse, why some of them are ending their lives despite such a fat bank balance? If money is enough to bring happiness and peace, these people, leave alone committing suicide or even being depressed, should not be even close to depression. This aspect is also seen in the great Indian epic Mahabharata after the war of Kurukshetra. As the Pandavas defeated the Kauravas, Yudhishthir, being the eldest of the Pandava brothers, was crowned as the King of Hastinapur. But was he or the other four Pandava brothers – Arjun, Bheem, Nakul and Sahadev – able to enjoy the fruits of the kingdom? 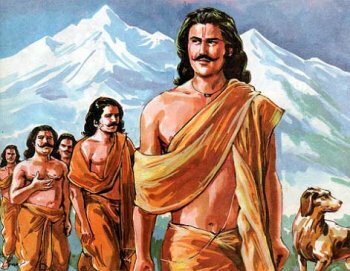 Despite being the rulers of the richest kingdom in the country, the Pandavas, especially Yudhishthir, weren’t happy or at peace simply because it was achieved after the annihilation of their own cousins, grandfather (Bheeshma), teacher (Drona), brother (Karna) and friends. Plus, thousands of warriors who fought for the Pandavas too had lost their lives on the battlefield. When a kingdom is achieved after such terrible carnage, it becomes meaningless. So the Pandavas were just unable to enjoy its fruits as they were feeling remorseful. Hence, they retired to heavenly abode. I am not at all trying to say that the war shouldn’t have been fought. It was absolutely necessary to preserve Dharma by not allowing the Kauravas to succeed in their evil ways. I am just pointing out that wealth doesn’t mean much in the presence of inner conflict and remorse. Now let us look at a fictional example. Mr X is the CEO of a big business empire. But his personal life is in disarray. His health is deteriorating while his family members are constantly into conflict. On the other hand, Mr Y is an executive earning a moderate income. With a healthy lifestyle, loving wife and obedient children, he is happy in his own little world. So who of the two is richer? You decide.